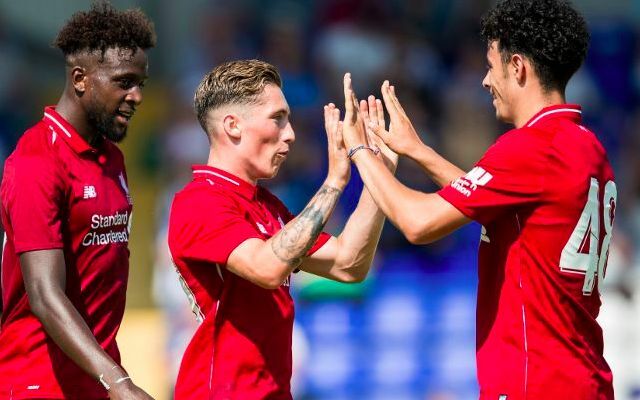 Liverpool fans are eager to see Jurgen Klopp retain the services of Harry Wilson ahead of the new Premier League season. The winger scored twice as the Reds started their pre-season preparations with a 7-0 win away to non-league side Chester. Wilson deceived goalkeeper Grant Shenton with a cleverly-lofted finish to open the scoring in the 36th after pouncing at Alberto Moreno’s rebounded shot. He then ran onto Curtis Jones’ perfectly-weighted pass before calmly slotting into the bottom corner to doubled his and Liverpool’s tally on the stroke of half-time. With all eyes on new-signing Fabinho, it was the 21-year-old that snatched the spotlight with his early claim for a place in Klopp’s first-team plans. It marked a perfect continuation from a productive loan spell with Hull City over the second half of last season, which saw him score seven times and play an instrumental role in helping the Tigers escape a shock relegation. Back on Merseyside, Wilson is now eyeing a prominent role in pre-season having been denied the opportunity to shine last summer due to injury. Another loan move may well prove to be on the cards, but Klopp will be in no rush to ship the Welshman out as he assesses his role. Harry Wilson just scores goals, wherever he plays, whatever level he plays at. We HAVE to keep Harry Wilson. No more loans. He’ll actually be a very solid squad player. Quality little player! I desperately want Harry Wilson to be the next young player to break into the first-team – and be a real option for the season ahead. Fingers crossed, he certainly has a composed, decisive edge about him. Say what you like about Harry Wilson, but I believe the best thing for his career is to stay with us and show what he can do from the bench and in rotation. It seems like we’d really be missing a trick if we loaned him out. He has all of the attributes to be useful for us.